Since 1924, Penn Herb Company, Ltd. has specialized in herbs, vitamins, and natural remedies. They have an extensive selection of over 400 wild crafted herbs, gathered from the United States and worldwide. Whether your preference is bulk tea, powder, liquid extract, or capsules, you'll find everything you need here. They receive bulk herbs daily, and then carefully mill, sift, encapsulate, and package them to ensure freshness. All bulk herbs are packed in specially designed air-tight, resealable ZIP bags to make sure your herbs arrive fresh and stay that way. Click Herb Listing to see their extensive selection. The Betz Family has owned Penn Herb for over 50 years, and they take great pride in their worldwide reputation for quality natural remedies and friendly customer service. For more than 3 generations, they continue to provide customers with fresh, high quality herbs and spices, pure essential oils, premium natural vitamins, homeopathic preparations, and unique natural remedies from around the world. To read more about the rich history of this family-owned company, click Penn Herb History. Penn Herb also has a complete line of vitamins and supplements made from the finest ingredients available to provide you and your family the best nutritional value. All vitamins and supplements are laboratory tested to meet the strictest quality control standards for potency and purity. Click Vitamin Listing to browse their complete line. For 40 years, I have ordered my herbs, vitamins, and natural remedies from the Penn Herb Company and have recommended this top-notch company in my work and books. Their friendly and knowledgeable staff can answer any questions you may have and also help you select the perfect products to match your health goals. One of the things I greatly appreciate about ordering through the Penn Herb Company is that orders can be sent anywhere in the world — and can be shipped directly to your home or office. Frequently, I also order gifts through this company to be sent to family and friends for any occasion. As I mention often on this website, the gift of health is the best gift you can give to yourself and others. In my booklet/CD combo entitled Herbs: Nature's Medicine Chest, I cover in detail how to use a variety of different herbs for whatever ails you. Living closer to nature has been a passion of mine since I was a teenager and my grandmother, Fritzie, taught me that "Health comes from the farm, not the pharmacy." When this versatile herb grows in most gardens, many people consider it a pesky weed and pull it out. But it deserves our highest respect. As a child, and still to this day, if I find the fluffy ball, I make a wish and blow on it as shown in the photo above. Dandelion root ranks right up there with Milk Thistle, Artichoke and Turmeric for remarkable liver support. The nutrient-rich tonic stimulates the removal of toxins and accumulated wastes; encourages bile flow for proper digestion and elimination, and promotes clear, blemish-free skin. 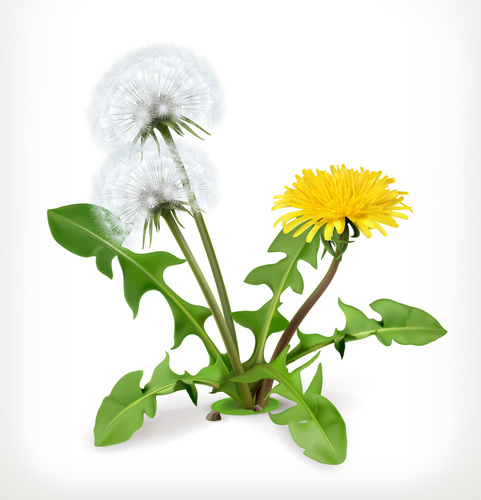 Also known as Lion's Tooth, Blow Ball, Taraxicum dens-leonis, and Wild Endive, the entire Dandelion plant is regarded as a “weedy wonder” because of its extraordinary culinary and medicinal uses. The leaf is nature’s ideal diuretic – it relieves temporary water weight gain and maintains the body’s natural water balance while supplying necessary potassium. Roasted Dandelion root is a robust coffee alternative with a strong espresso-like flavor—and with ALL the therapeutic benefits of Dandelion! The full-bodied beverage supports healthy liver and digestive function. Dandelion leaves are also a popular choice for building blood and promoting blemish-free skin due its high content of important nutrients, such as iron, vitamins A, C & D.
Personally, I use some form of Dandelion daily in my healthy nutrition program whether as a liquid extract, capsule, tea, leaf, or root. 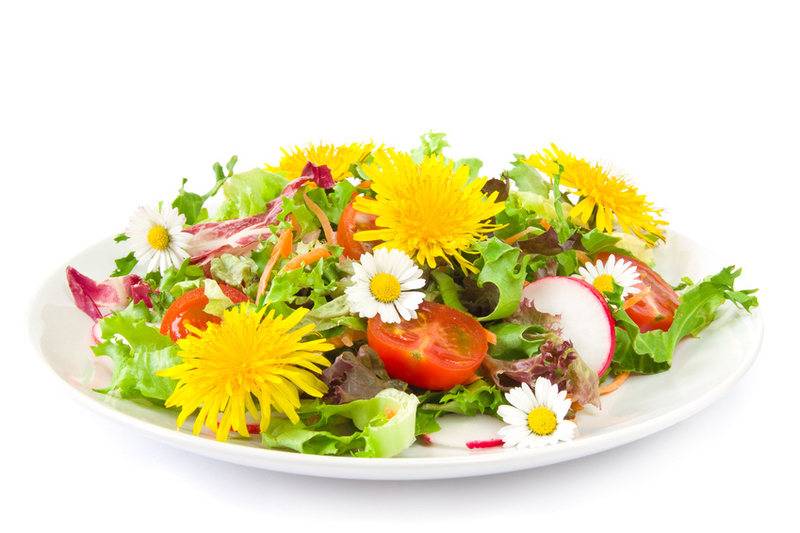 As shown above in the photo, I also put organic Dandelion leaves and flowers in my salads. The Penn Herb Company is where I purchase my Dandelion product and all of my natural remedies. Their quality is premier and they deliver right to your front door. Contact: 800-523-9971 (US & Canada) or 215-632-6100 (Intl), both ET, M - F, 8:30 - 5pm. They carry over 4,000 herbs and natural remedies, including for the recipe above... cinnamon sticks, roasted dandelion root, ginger powder, and chicory root. Visit: PennHerb.com. Spices: The very word conjures up visions of exotic tastes and places around the world... and well it should. Throughout history, spices have been searched for in far-away ports for their culinary and medicinal value. When you have the spices of the world at your fingertips, you can create the delicious and exotic dishes of far-away cultures. Using spices in your cooking is not only tasty, but healthy, too, as I write about in my booklet/CD combo Culinary Herbs: Discover the Healing Secrets in Your Spice Rack. The medicinal value of turmeric, cayenne pepper, cinnamon, fenugreek, garlic, ginger and many other spices is widely accepted in cultures around the world. Each one is packaged in a convenient shaker-top bottle, sealed tight for freshness. All spices are hand-selected to be the highest quality available. Why buy spices from Penn Herb Company, when most are available at your supermarket? The answer is price, quality, and selection. Penn Herb offers the highest quality spices at reasonable prices. Also on the Penn Herb website, you will find all of my booklet/CD combos along with some of my latest books. They are providing you with an herb-booklet package deal, which contains all seven of the booklets below, each with a FREE audio CD or DVD. These seven booklets are all reader-friendly and easy to carry in your purse or briefcase, carry-on flight bag, or to keep on hand in your car or on your bedside table. This health-promoting set also makes an excellent gift to give family and friends. For more information, please click HERE.